This is a 1915 publication by The Standard Publishing Company of Cincinnati. James Gilchrist Lawson (1874-1946) was a British author and compiler, his most well-known book being Deeper Experiences of Famous Christians. He wrote many biographical sketches and also edited early reference Bibles. Much of his writing was connected to Pentecostal history, though Lawson himself seems to be fairly independent of it, and from his study on baptism you would think he was a Baptist. In any event, this is a remarkable study of the history of Christianity and baptism. Lawson traveled world-wide to many libraries and did first-hand work. He has whole chapters on what encyclopedias say, on what dictionaries say, on the Greek lexicons, the classic Greek writers, the early Christian writers; how the Catholics, Lutherans, Anglicans, Methodists, Presbyterians, and Quakers all admit to immersion being the original meaning of the word baptizō. The quotations from their own writings is very instructive. The first paragraph of the conclusion is this: “Baptize is the English form of the Greek verb baptizo. Baptizo always implies an immersion, either by dipping into or by overwhelming with an element of some kind; but primarily it means to immerse in water. All of the standard dictionaries, lexicons, encyclopedias, commentaries, histories, early Christian writings, classic Greek writings, different versions of the Bible, and all impartial scholars, are agreed concerning this, as nearly, perhaps, as on any other subject. No English word that does not express immersion can be substituted for baptizo in the Bible or in Greek literature of any description. 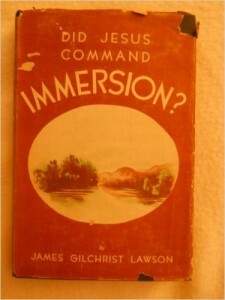 Therefore, JESUS COMMANDED IMMERSION” (sic).